The syncing of data between Xero and Figured happens automatically every 4 hours, via a secure API. If you need to sync Figured with Xero immediately, you are able to push through a manual sync. You can do this by going to Settings > Xero Connection, or by clicking on the Xero icon in the bottom left hand corner. These arrows will take you to your sync status page, displaying when your farm last synced to Xero, as well as showing any progress of a current sync if one is running. 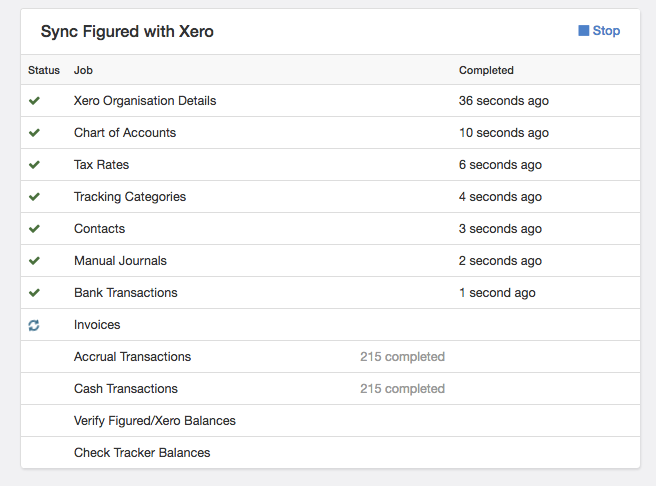 Clicking Start will start your Xero sync, and the page will load to show you the current progress. If you wish, you are able to Stop an ongoing sync if you only need to sync one part (i.e. your chart of accounts).